I feel kitschy, and silly, and bright. So, I got bored with the plastic Softsoap bottles I had in my kitchen and bathroom, and I decided they needed to be "dressed up" a bit. 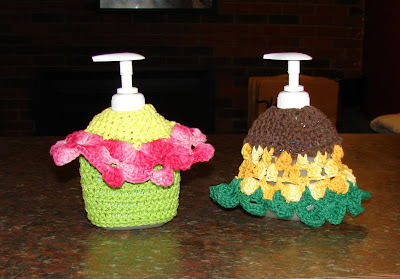 Here are my ultra silly, totally unnecessary floral "soap pump cozies". What do you think? Hey, maybe I'll make the pages of that "What Not To Crochet" blog! Still, I just love these silly things. Now the big question is, if I write up a pattern would anyone want to buy it? I think I'll make some soap savers to match... oh, maybe even a TP cover-- how funny would that be! OY VEY! I like them. I did that with mine and my brothers said that's all you'd need to do to give a gift... mine where cinched at the top with a crochet tie into a bow. Ah, perfect!! Kinda like my "Pringles" brand snack chip container cozy. Only nicer. Kitschean!